Policy makers need to explore ways to strengthen oversight over the timber trade, strengthen law enforcement and empower districts. The growth of Chinese economic interests in Africa has provoked a sensationalist response in the international media. Africa - A popular global narrative portrays China’s business interests in Africa as single-minded, driven by a powerful nation hungry for natural resources to fuel its ever-growing domestic and international industrial needs regardless of the social and environmental costs. A counter-narrative suggests that African states should choose economic partners based on their own interests, and that new Chinese forms of aid, trade and investment represent a welcome alternative to Western development models that have failed to effectively address poverty in Africa. In fact, there are a wide variety of business models and trade networks connecting the Chinese market to African investment opportunities and natural resource supplies, research shows. Over the past several years, the Center for International Forestry Research (CIFOR) and research partners have been exploring these topics to contribute to a deeper understanding of the China-Africa relationship, especially within the global timber market. “Especially since the last decade, the growth of Chinese economic interests in Africa has provoked a sensationalist response in the international media, which is now tempered by an initial round of field research demonstrating that circumstances surrounding Chinese involvement are complex and differ greatly from place to place,” said Louis Putzel, a CIFOR senior scientist. “There is no one-size-fits-all policy response,” he said. After years of heavy timber exploitation in tropical Africa’s coastal countries, especially to satisfy China’s demand for some of the more abundant species used to make plywood, demand for specialty hardwoods is now pushing logging activities further into Africa’s heartlands in the Democratic Republic of Congo and Zambia. The research, conducted between 2011 and 2013 in the tropical forest countries of the Congo Basin and the Miombo Woodland countries in eastern and southern Africa, is summarized in an information brief written by scientist Xiaoxue Weng and others. It recommends that policymakers acknowledge the diversity found in Chinese and African business models, while considering the role of local African entrepreneurs and the international community to achieve a sustainable and socially responsible timber trade. “Companies operating in the China-Africa market range from large state-owned Chinese corporations to private companies of all sizes, which can be headquartered in Africa, China or somewhere else entirely,” Putzel said. “No single set of national laws nor any single trade convention can cover all the potential sources of social and environmental risks, and certainly current laws governing the global timber trade don’t in any way address poverty in tropical producer countries,” he said. China is the world’s largest importer of tropical wood. The country of 1.35 billion people increased the proportion of its imports from 35 percent in 2000 to 78 percent in 2009, making the commodity the third-largest export from Africa after oil and mineral ores, the research showed. Four of the timber-producing countries in which CIFOR conducted research — Cameroon and Gabon in the Congo Basin, and Mozambique and Zambia in the Miombo Woodlands — represent 40 percent of Africa’s wood exports to China by value, equaling $543 million in 2012, according to statistics from U.N. Comtrade. “A striking fact, given the high volumes of trade in timber from Africa to China, is the extremely low level of Chinese investment in African wood industries,” Putzel said. 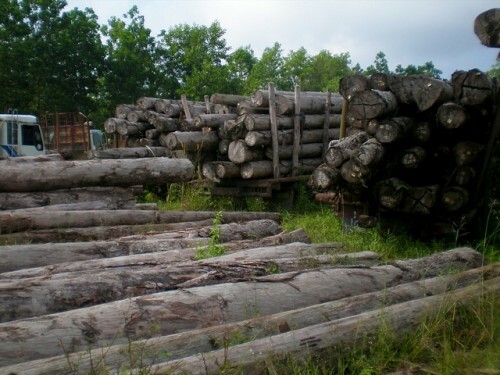 The research led to recommendations that African governments engage with Chinese institutions to explore ways to strengthen oversight over the timber trade, strengthen law enforcement, empower districts to take more responsibility for local resources, and address corruption among national and local level officials. It found that more attention should be paid to social equity concerns, improved management of forest stocks, and the development of more efficient domestic processing and manufacturing sectors. In the latter regard, Chinese investments would be very beneficial, Putzel said. The international community should recognize the limitations of Chinese government influence over private businesses operating overseas, but should continue to hold China to high standards in monitoring its own imports, he said. Meanwhile, “Chinese institutions, including research institutions and sectoral ministries, could take a greater interest in issues of poverty and economic rights surrounding the extractive industries in Africa, from where China imports billions of dollars’ worth of raw materials,” Putzel said. “In particular, the large number of smallholder loggers and small companies involved in the sector highlights the importance of considering social equity in policymaking,” Putzel said.